As a young audiophile, I thought there was a correlation between speaker size and sound quality. Names like Wharfdale, Bozak, JBL, and Klipsch dominated the high end in those days. In fact, 25+ years ago, most smaller bookshelf speakers were cheesy, vinyl-clad, particle board boxes with cheap drivers and a sound to match. 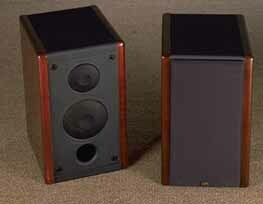 About 20 years ago, an Army buddy bought a pair of Rogers Studio 1s, and after hearing them I was floored. Granted, the deepest bass was lacking, but the mid-range clarity and high frequency detail were an epiphany. I later enjoyed owning smaller speakers (Monitor AudioStudio 6, JM Labs Micron Carat) in my own system. Stand mounted, smaller-box speakers can image incredibly well, and for many audiophiles, remain the choice for their reference systems. So when Chuck asked me to listen to the revised APL Serenades and give my impressions, I quickly decided to accept his offer. The APL Serenade is designed and manufactured by an Atlanta company offering a broad line of Commercial, Pro sector, Home Hi-Fi, Home Theater loudspeakers and subwoofers. Most models feature a patented "Acoustic Power Lens" (APL) driver system. In brief, the lens consists of a thin, flat, double layer Mylar diaphragm affixed over the face of the tweeter and woofer. This would tend to make the speaker a pseudo-planar driver and its sound may also benefit from correct time-alignment between the drivers. The lens also produces a wide and symmetrical wavefront with little if any "lobing" and a smooth power response. The Serenade is an well-built, attractive, stand-mounted (or bookshelf), 2-way design using a 5.25 inch woofer and 1 inch tweeter with a front-facing 2 inch port. Both drivers are covered with a perforated metal screen to protect the Mylar surfaces. They weigh 18 lbs. each and measure 13.75 inches high x 8 inches wide x 10.5 inches deep. The cabinets are quite rigid and well braced with little if any cabinet vibration to color the sound. A single pair of high quality, easy to access gold plated binding posts are fitted. This new model 6800 is expected to retail for around $1500 per pair. Reference system: Source- CAL Delta transport, Alpha DAC; Amps- Aranov LS-960I; Speakers- JM Labs Daline 3.1; Interconnects- the excellent custom-made, solid silver design of AAS member, Craig Nance; Speaker cable- Nordost Super Flatline; Target stands (sand/lead filled); Accessories- Tip toes, Custom sand filled isolation platforms, Listening room- 12 feet x 18 feet x 8.5 feet augmented with Michael Greens Room and Corner tunes. I had previously given the original Serenades an extended listen and found them detailed and quick without being overly analytical. They reproduced a wide soundstage with adequate depth and dynamics were handled with ease. I found them to be a bit on the bright side, but not so much as to be fatiguing with long term listening. The revised Serenades have a modified surround on the woofer and a thinner space between the mylar layers of the tweeters APL. This modification reportedly removed a treble bump that was accounting for the brightness. The sound: Since the speakers were new, I broke them in with pink noise for about 5 days. After fiddling with placement, I found the best sound with the speakers positioned about 3 from side walls and 1 from the back wall facing straight forward with the grill cloths off (the original version had a slight brightness to the sound and I preferred the grill cloths left on the speakers). But I found these speakers to be one of the least sensitive to room placement Ive heard. The wide dispersal pattern of these speakers reproduce a large sweet spot in the listening area and make room placement not as critical as is with most other designs. The front facing ports also allow for near wall placement without causing a muddy boominess in the mid-bass. Using the Stereophile Test CD, bass response was strong to 50Hz with significant roll off noted at the 40Hz tone. Mid-bass and bass was tonally correct. The Serenades do play music. I decided to challenge them with the same revealing and dynamic recordings that I used on my prior listening of these speakers. On Hellbound Train, from Steve Tibbetts, The Fall of Us All, ECM 1527, the soundstage clearly extends 3-4 feet lateral to the speakers and the percussion sounds quick and snappy and spread out in front of the listener. This effect is also noted on Fioranapolis, Live From the Royal Festival Hall where Trilok Gurtu demonstrates why he was Percussionist Magazines, Musician of the Year, in 1994. The Serenades handled the percussion transients with ease. The depth of the soundstage is also notably improved over the original version. Vocals are also handled well. Running From Mercy, from Ricki Lee Jones, Traffic from Paradise, Geffen 24602, has several back up singers. Each of these can be heard in their own space, not some amorphous, congealed voice. The Serenades also lack sibilance on voices. Emmy Lou Harris recordings are a great test for this. Her voice can sound hard, edgy, and sibilant on many of her songs and less than worthy speakers fail, but the Serenades handle it without strain. Detail, without exaggerated brightness, is also a strong point. Guitarists, Strunz and Farah, are renown for their lightning fingers. Listening to Rainmaker, from their Primal Magic CD, Mesa 79023, they volley solos with long 32d note runs. The Serenades play every note without blurring or smearing the sound. The upright bass on Scott, from J.E. Jenny-Clarkes self titled CD, CMP CD32, is right in the room. You can distinctly hear the cat-gut strings hit the finger board. Tonal balance was excellent without any noticable bumps across the frequency spectrum. The Serenades offer a balanced sound that would give the listener an opportunity to listen to music for hours, unlike many speakers that have a hyper-vivid, Technicolor type of sound to them. While initially impressive, those speakers' sound becomes irritating after a short period. Are the Serenades then perfect? Not quite. As with the majority of speakers their size, they lack deep bass, so orchestra lovers would likely need a sub-woofer to get that viscerally impacting low end. But the sonic attributes of the APL design make this speaker unique. Its ease of placement would make this speaker an excellent choice in a home theater set-up while still doing commendable duty in a hi-fi system. In summary, the Serenade is quite an accomplishment in its price range and definitely worthy of consideration in an audiophiles system. I look forward to hearing some of their other designs in the future. Mike Masztal is a member of the Atlanta Audio Society. This article originated there and has been printed with their permission. As a body, the society does not endorse or recommend any product or service. The opinions expressed herein are solely that of the author.